Cybersecurity has continued to be a hot button issue in Washington throughout Q1 following the headlines around securing voting infrastructure in November of last year. While government cybersecurity defenses passed their November test, they were met with unwelcome news transitioning into the new year as a 35-day partial government shutdown cut cybersecurity staffing via a furlough. In fact, DHS officials noted during the shutdown, which ended on January 25th, that 43% of its CISA staff were not working during the period. They returned to find missed patching updates, expired web encryption certificates and unanalyzed security logs. With these workers back on the job, the team at Morphisec wanted to revisit our U.S. Citizen Threat Index and see how Americans’ perception of the country’s cyber defenses has evolved since Q4. To find out, we once again surveyed 1,000 US respondents aged 18+ and weighted for the US population by age, region, and gender. Responses were gathered at the end of Q1. Not surprisingly, with the elections behind us, the number of citizens thinking there’s a heightened risk of a cyberattack has dropped since Q4 2018. However, it didn’t drop by much, indicating that cyber threats are still very much on the public’s mind. In Q4, 54% of citizens believed there was an “elevated” or “imminent” chance of a state-sponsored cyberattack. That number dropped to 51% of citizens with the same response in Q1 of this year. Meanwhile, 35% said their fear level wasn’t any different than at other times (up from 33% in Q4), and the percentage of citizens not fearful of a current cyberattack increased to 14% from 13% in Q4. Morphisec’s report in Q4 found that 1 in 5 Americans is most fearful of a state-sponsored cyber attack that targets the U.S. elections. This fear of a targeted cyberattack aimed at affecting election results came out above Americans fears of a state-sponsored attack that disrupts communication, sabotages physical infrastructure, or cripples transportation. With the November elections taking place without incident, fear levels have receded slightly. But do citizens have any lingering concerns with the nation’s cyber defenses after the shutdown? When respondents were asked if they believe the government shutdown impacted its cybersecurity defenses, nearly half of respondents (49%) said they think the government’s cybersecurity defenses were impacted during the government shutdown; however, there’s variance in the belief of severity. 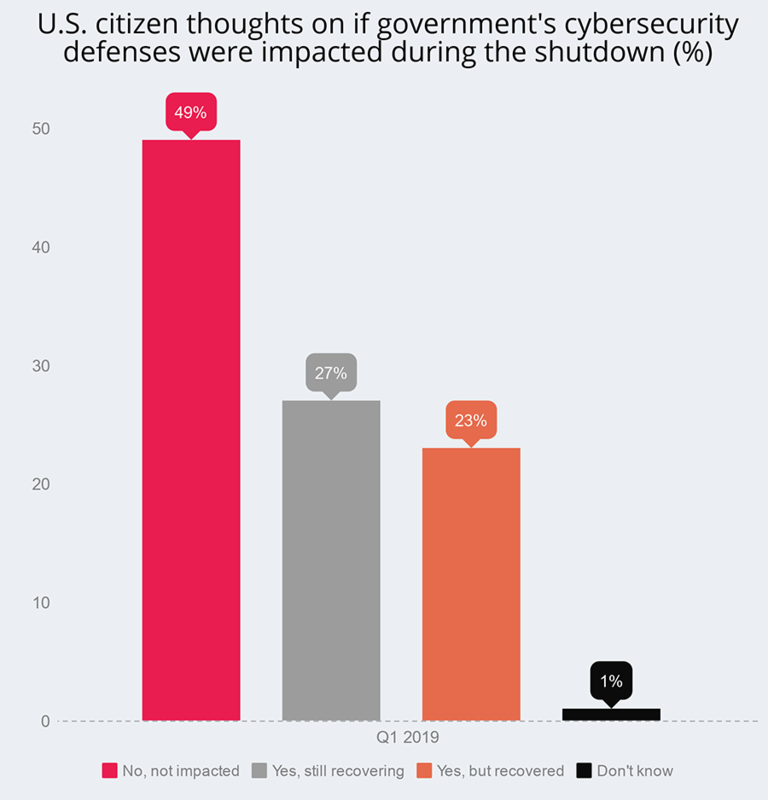 In fact, more than 1 in 4 Americans (27%) believe that government cyber defenses were made more vulnerable and are still recovering from the short staffing and curtailed attack thwarting efforts during the shutdown. Furthermore, 23% think the government’s cybersecurity defenses were temporarily made more vulnerable and have now recovered. 1% of respondents were not sure. Some of these new fears may not be alleviated by the recent news of turnover at the top of DHS. Some are speculating that Kirstjen Nielsen’s departure could create further difficulties for the agency to respond to cyber threats with its private partners in critical infrastructure areas such as finance and public utilities. In addition, a leadership gap could further diminish the ability to attract top talent and expertise from the private sector. Morphisec’s U.S. Citizen Threat Index in Q4 highlighted that DHS and other government agencies are already behind their private sector companions in the minds of citizens when it comes to the ability to thwart state-sponsored cyber attacks. More than 60% of Americans say they believe that the private sector has better cyber defenses than the government for thwarting sophisticated attacks from foreign adversaries.